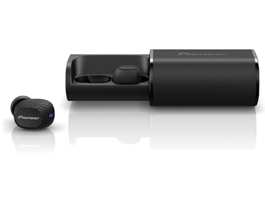 Truly wireless earphones are all about balance, and the C8s from Pioneer are on the money. Sound is excellent with deep bass from powerful drivers and AAC codec delivered via Bluetooth® wireless technology. Battery life is strong: charge up for three hours of listening and the carry-case will charge the earphones twice before needing to charge the case. Voice access to smartphone assistants, hands-free calling, and music control come via buttons designed for easy convenience. The C8 works with an Android™ app that reads out notifications, a feature unique to Pioneer. But the difference is in the detail: unique L/R shapes, body-agnostic charging ports, textured silicon sleeves for grip, and LED battery indicator on the case. Light, practical, immersive, the C8 truly wireless has freedom you need. Say goodbye to cable hassle and annoying adapters. 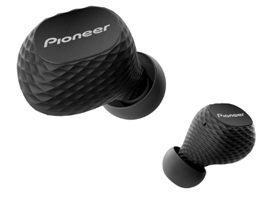 These truly wireless earphones crafted by Pioneer brings great sound quality, convenience, and free movement, together in a light and comfortable headphone. Simplicity starts right out of the box: independent earphone shapes suit left and right ears, so you don’t have to figure out which earbud goes in which ear. The Silicon sleeve is sweat resistant and dimpled texture to give comfortable grip. Three hours of playback is perfect for most. Pop the earphones in the case and you’re good to go in one hour. The case recharges the C8s twice before needing to charge the case again. L/R earphones snap into either charging dock. The case has an LED showing battery life remaining when it’s tapped.